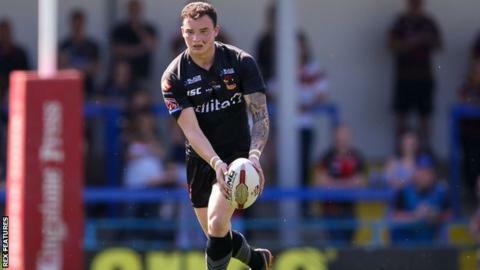 National Conference side Thatto Heath, based in the rugby league hotbed of St Helens, held Dewsbury - two levels above them - 10-10 at half-time but the Championship side pulled away after the break. The trio join Widnes in Monday's draw after the Vikings ran out comfortable 44-12 winners over York City Knights in another all-Championship affair on Saturday. They lost 24-16 at second-tier Halifax while, in Thursday's other game, Hull KR survived a scare to see off Championship visitors Leigh Centurions 14-10. The remaining eight Super League clubs - St Helens, Warrington, Castleford, Wakefield, Hull FC, defending champions Catalans, Huddersfield and Wigan - join the competition in round six.